Using games and activities is a great way to help children learn about healthy eating while having fun at the same time! The ideas below can be used to engage children in healthy eating experiences, teach them to recognise different foods and encourage them to experiment with new foods, tastes, flavours and textures. Try this activity to increase children’s recognition and awareness of different vegetables. Place some vegetables (real or plastic) in a bag (e.g. pillow slip). Ask children to feel inside the bag and guess which vegetables are there. As a variation, blindfold children and place a vegetable in their hands. Ask them to guess what the vegetable is by feeling, smelling and even tasting it. Each week taste and discuss healthy foods which start with the chosen letter of the week. For example, for the letter ‘M’ try mushroom, milk and mango. Say a series of four words including three vegetables and one odd word, for example, “Carrot, potato, cat, onion”. Ask children to identify the odd word. Make the game more challenging by using an odd word that is also a food, for example, “Celery, capsicum, carrot, yoghurt”. Ask the children why the odd word does not belong with the rest of the group. 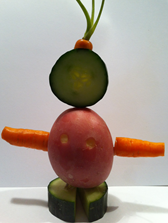 Create a ‘vegetable person’ using real vegetables or pictures of vegetables. Help children use toothpicks to make their vegetable person stand up and be three dimensional. If using real vegetables, encourage children to eat their vegetable person for morning or afternoon tea. Excursions to places like a farm, food market, supermarket, bakery or butcher are fun and educational. Try to have a clear objective in mind, something that you would like the children to gain from the experience. Follow up the excursion with related activities like discussions, drawing pictures and food tasting. For example, visit a farm and watch a cow being milked. Then discuss with the children how yoghurt and cheese are made. Talking about fruit and vegetables helps children recognise and become familiar with different varieties. Cut out fruit and vegetable shapes from coloured felt and ask children to label each item as they are placed on a felt board. Sing songs and read stories about the fruit and vegetables on the board. Offer different kinds of healthy foods to try on a special theme day. For example, on healthy apple day offer green apples, red apples, dried apples, pureed apple and canned apples. Create a visual food alphabet wall display. Children can cut out pictures of food and match these to a letter or draw their own impression of the food. Source: All about food: A resource for services caring for children, Queensland Health, 2006. Use flash cards or cut out pictures of foods from brochures to make a healthy, tasty snack. Some examples are toast, cheese and tomato, fruit with yoghurt, capsicum and carrot sticks with mashed avocado, scrambled eggs with English muffins. For more information see the Australian Avocados website. 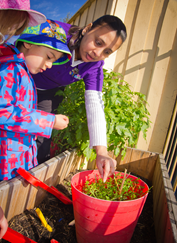 Create a veggie patch and encourage children to water and care for the plants. Use the exercise as an opportunity to discuss where food comes from and how it grows. Some easy to grow, edible produce includes tomatoes, peas, beans, snow peas and herbs. “I am thinking of a food which begins with the letter....” Give extra clues like colour, shape, texture etc, until children correctly guess the food. Let children take turns to choose and describe a food. 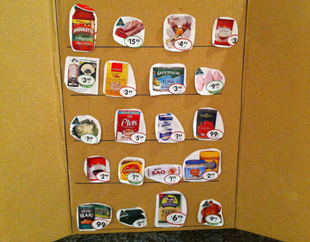 Make a food cupboard out of a large piece of cardboard by folding in both the side edges to form the doors. Draw shelves in the cupboard. Glue food pictures onto cardboard backing for durability. Children can stack shelves with food pictures and take food out of the cupboard to prepare imaginary meals. Fill two small bowls with water and mix salt into one of the bowls. Label both bowls so you know which one has the salty water. Cut a potato in half and place each half into a bowl with the cut side down. Leave for about 30 minutes and watch what happens – the salt water draws water out of the potato, causing it to shrivel. Explain to children that just like the potato loses water when put in a salty solution, salty food and drinks make people thirsty, and that these items should only be eaten occasionally. For more information, see the Healthy Kids website. Encourage children to take turns tasting new foods and describing to the group what the food tastes like. Children can also discuss the foods’ appearance, smell and texture. Celebrating different cultures and festivals with food is delicious and fun for children. You could make vegetable and lean meat dumplings for Chinese New Year, eat wholemeal pancakes morning tea on Shrove Tuesday, make an Irish soda bread to eat on St Patrick’s Day and decorate hard boiled eggs with food dye for Easter. Try these fun food songs from Australian performers: Watermelon (Justine Clarke), Fruit salad or Hot potato (The Wiggles), Wash your face in orange juice (Peter Combe). You can search ‘fun food songs for children’ on the internet for more ideas. Create an ongoing discussion about food by using books and displaying posters on food and drinks. You could display posters of all kinds of foods from the five food groups (such as fruit and vegetables), the Australian Guide to Healthy Eating plate, foods children eat from all over the world, and more.